The second expansion to the cool wargaming/RPG-hybrid Frostgrave clocks in at 62 pages, minus 3 if you do not count editorial, etc., leaving us with59 pages of content. This book was moved up in my review-queue due to me receiving a print copy of the book. All right, let’s begin this review with a kind of template, the most unique modification to the wizard you may achieve while using this supplement. The dungeons below Frostgrave, the eponymous breeding pits, were the haunting ground of the beastcrafters…and their tradition can be experienced in a novel manner: Provided the wizard finds the right grimoire, he may attempt to brew the elixir of the beastcrafter via the Brew Potion spell. In order to benefit from it, the wizard basically has to have 100 experience points for a level-up ready and expend these; an apprentice has to drink alongside his wizard. Successfully drinking the elixir nets you bonuses to cast certain spells and adds new Animal Companion options…however, you also take on bestial features, increasing the cost of all soldiers hired but war hounds. The elixir needs a minimum level of 5, with stage 2 and 3 of the transformation, with progressively better benefits increasing the minimum required level by +5 respectively. And yes, higher levels net special benefits like wings, scales, etc. The pdf also introduces two school-less beastcrafter spells and may only be cast by beastcrafters. Effect-wise, they allow for the temporary or permanent mutation/modification of animals. Speaking of spellcasting: The book increases the dynamics of spellcasting significantly with so-called reaction spells; as long as the spell’s conditions are met, it may be cast at any time…but upon the next activation, the respective spellcaster is considered to have already cast the spell in question. 5 of these are provided -and frankly, I wished we got more…and a new out-game spell of a now extinct magic tradition that allows you to penalize experience points gained. Yup, your foes will hate you for it. Yup, it is incredibly gratifying to cast. 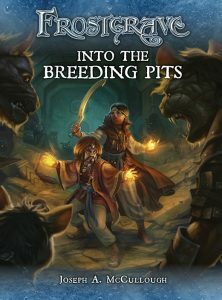 Now I already mentioned the eponymous breeding pits being subterranean…and this is basically what this is about: This book allows for DUNGEON-EXPLORATION!!! Yep, you read right – a whole new gaming experience. The book concisely defines underground exploration: The effects or lack thereof from Crumble to Plane Walk are covered and setting up walls, doors and doorways and ceilings are concisely presented alongside restrictions of lighting. Burrowing creatures can make for nasty surprises…and speaking of which, the book presents rules for the vast amount of traps – a total of 20 unique and evocative traps are provided and yes, depending on the character affected, they may gain bonuses to resist the nasty effects of these obstacles. Traps are sprung, btw., when someone rolls a 1 on an initiative roll…and said player may CHOOSE who is affected by the trap! This can turn a dismal frown to cheers at the table and is extremely rewarding. From magic-cancelling waves to gaining a personal demon, they are very diverse and, more importantly, fun. Speaking of fun – on the other side of the spectrum, rolling a 20 on an initiative roll means that the player’s squad has discovered a secret passage. When any figure of the player’s choice is activated, said figure may move THROUGH dead space like walls etc. – but only alone, unless used in conjunction with group activation. Cool: Both of these work in conjunction with both regular AND dungeon set-up, taking spells and options into account. These two amazing subsystems also tie into the new soldiers: Trap Experts are superb at resisting traps and extends the “trap range” from rolling a “1” to also applying when rolling a “2”, but only 1/game. Tunnel Fighter similarly extend the “secret passage found”-range to also apply on 19s, but only for the tunnel fighter. Costs and stats are well-balanced, considering the effect of these abilities. The book also features new magic items, including a proper table – a total of 17 such items are provided and they actually leave the game better balanced than before, with e.g. chronomancy gaining some seriously cool options via items. A random encounter table for the breeding pits can be found herein alongside 12 critters – from hyena and gnolls to poisonous amplipedes, petrifying basilisks, the book has some classics, including nasty giant worms, minotaurs and hydras – the latter of which come with modifications that represent rare strains and rules for multiple headed hydras. Finally, there are devourers – huge, nasty and very powerful beetles that are harmless…until angered, when they become a superb force of burrowing destruction. In the hands of the right player’s schemes, they can be utilized in game-changing manners. Anyways, the book also features scenarios that make use of the amazing rules presented herein: The Moving Maze represents the exploration of a maze f fungoid structures – it’s alive and the player with the lowest initiative may actually move terrain! This is exceedingly rewarding and can lead to amazing games. “Here comes the Flood” is similarly cool: Exploring a canal, there is a flood approaching; after a couple of turns, there is a chance every round for the flood to hit…with devastating consequences if you’re caught…and yep, this can make for a perfect “RUN!!!”-moments. The Breeding Pit is less interesting – basically it is a random monster-spawn scenario, mainly here to get a Book of the Beastcrafter. “The Rats in the Walls” spawns giant rats near treasures and dumps them on characters instead of trap effects for a simple, but efficient tweak of the engine. My favorite scenario herein would be “Breeding Season” – basically, it’s the devourer showcase – they get a modified “AI” and move towards one another…but when ANY of them is damaged OR when they get close to one another, they start berserking! This can allow you to royally screw over the other player…or have all wizard parties caught in a nightmarish fury of killer beetles! Editing and formatting are very good, though not as precise as in the other Frostgrave supplements; I noticed a couple of small hiccups, but none pertaining the exceedingly precise rules-language. Layout adheres to Frostgrave’s neat 1-column full-color standard and, once again, we get cool evocative flavor test in sideboxes. Artwork features both photography of full-color minis and excellent full-clor artwork. The physical version is a nice softcover with high-quality, thick, glossy paper. I can’t comment on the electronic version. James A. McCullough’s “Into the Breeding Pits” is one phenomenal supplement; I mean it. If you get any of the expansions, get this one. Where “Thaw of the Lich Lord” added to the options, this one MULTIPLIES them. From the amazing trap and secret tunnel rules (which you can easily modify to happen more often, if you wish to) to the concise presentation of subterranean adventuring, the book is glorious. Reaction spells and the new soldiers add further tactical depth to the game and after you’ve added these rules, I guarantee you will never want to play a Frostgrave game without them ever again. This is a great game-changer for the engine of the game and superb in every way….though the RPG-dude in me wished it had a campaign. Then again, who cares? The scenarios, with one filler-exception, are fresh and cool and the book, as a whole, is worth every cent. If you play Frostgrave, then you NEED this book. My final verdict will be 5 stars + seal of approval. You can get this glorious expansion here on OBS! You can get the print here via Osprey Games!